Tips for Setting up and Running a Garage SaleEliminate The Muda! Anybody can put on a garage sale, right? All you have to do is throw some stuff on a table, sit on a chair, and wait for shoppers to arrive. While this is the basic theory, it is far from the truth. If you truly want your garage sale to be a success it is important that you focus on the finer details. From start to finish, you need to know what steps to take as well as what you can do to improve your chance of a successful event. 1. Market your garage sale well in advance. The biggest mistake that many people make is forgetting about marketing, in hopes that word of mouth takes care of it for them. If you are going to have a garage sale you should market your event at least one month in advance. You can do this in a number of different ways, including in local newspapers and with signs. Of course, there is nothing wrong with word of mouth marketing. Just make sure that you combine it with other efforts. You don’t want to have put all this effort into an awesome garage sale only to have its success diminished by the simple fact that not enough people knew about it. 2. How are you going to set up your garage sale? A lot of this has to do with the amount of stuff that you are trying to sell. There are two things you can do to make the setup process simple. First and foremost, stay organized. The last thing you want to do is dump a bunch of stuff in your yard and hope for the best. Use tables when applicable and place large items in easy to access areas. Along with the above, make sure you are in position to keep an eye on everything that is for sale. Although it is not common, there are people who will try stealing from your garage sale if they think they can get away with it. 3. Get some help. While you may be able to set up and run a garage sale on your own, you are putting a lot of stress on yourself. The more help you have the better off you are going to be. Even if you just have one helper, it goes a long way in making the event more enjoyable for both you and those who stop by. 4. Be ready to negotiate. The majority of people who shop at garage sales do so because they are looking to save money. For this reason, they will be ready to negotiate from the moment they arrive. Before your big day, have an idea of what you are going to ask for every item. On top of this, know the minimum that you are willing to accept. At times, you may have to turn somebody away because they are not willing to pay your asking price. This is all part of having a garage sale. Just don’t try to decide on a minimum price on the spot because you might be pressured into a price and regret it later. There is more to a successful garage sale than lining up old junk and hoping to make a few bucks. If you follow the detailed tips above, your garage sale will be a success and you will make more money than you ever thought possible! Do you have any experience running a garage sale? Any additional tips you can add? Sell sell sell- be prepared to talk things up and tell people where your bargains are and anything you are giving away for free. You hit all the basics and this would be a great time to do one if you have good kids clothes to sell for school. Hey Greg-san, is that you!? This is a good article. I’m always looking for smart resources to send to my coworkers, and your piece is certainly worth sharing! I thought this was an awesome post! First most people wouldn’t think that a garage sale would be a place to make a few extra dollars and second they don’t approach it with a plan. I loved the break outs here – it’s the approach I would take as a consultant 🙂 You are totally spot on when you said there’s more to a garage sale then just lining up old junk and even the serious garage sale shoppers can spot the places they think are worth stopping at. These are great garage sale tips! 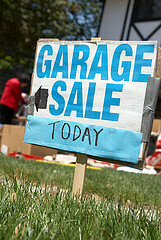 When advertising for your garage sale, be sure to highlight any big ticket items you will be selling. For example, if you are selling any furniture, collectibles, electronics or appliances make sure that you advertise their condition and price in order to draw attention to them. I found that in most garage sales I have had, it is these kinds of big ticket items that will make you the most money, and the other little things aren’t worth as much time. I once sold almost everything in my house doing 3 garage sales. It’s a PITA, but well worth it. Total was like $5K for EVERYTHING. You just gotta know how to hustle and sell. This is a good list. Holding a garage sale is a lot more work than it seems. Signs, signs, and more signs. I am constantly surprised by folks who put up a very nice fluorescent pink signs at the main street, with the street address in size 10 typeface (so you can’t really read it as you whiz by with a tailgater stuck to your rear), and that’s it, no more signs after that. Waste of time.